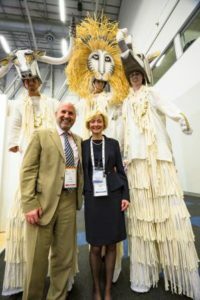 The RCOG World Congress 2017 (Royal College of Obstetricians & Gynaecologists), incorporating the ISUOG’s 13th International Symposium (International Society of Ultrasound in Obstetrics and Gynecology), was held at the Cape Town International Convention Centre in March, and the Turners Conferences team have been congratulated by the client for their part in making the congress the success it was. Over 2300 delegates from 77 countries, including 25 African countries, attended the three-day event. A custom mobile App, developed for the Congress, kept delegates up-to-date with the programme. This was an essential feature of the Congress which enhanced delegate experience. There were also surgeries that were live streamed from locations around the world and viewed in Cape Town. “An innovation which allowed delegates at the Congress to communicate directly with the surgical team on the other side of the world,” added Gill. Medical achievements were also celebrated. There was a standing ovation for an inspiring plenary lecture on the mothers2mothers HIV and Aids Transmission Mentoring program (m2m). In the past fifteen years, HIV infection in babies has dropped from 1500 per day to around 400 per day. Of these about 300 occur in sub-Saharan Africa so the work by m2m and other organisations is crucial. m2m trains, employs, and empowers local mothers living with HIV as frontline healthcare workers in understaffed health centres and within communities. Some of the leaders in the medical and pharmaceutical industries exhibited at the Trade Exhibition which took place during the congress. Storz, Humor Diagnostica, Johnson and Johnson, Ferring, Hologic were among the 60 exhibitors. Delegates were able to learn more about new products and services available to them and at the same time network with their peers during the numerous social events. 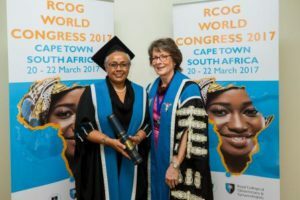 Her Eminence Mrs Margaret Kenyatta and Dr Nkosasana Dlamini-Zuma accepted Honorary Fellowships from the Royal College of Obstetrics and Gynaecologists. 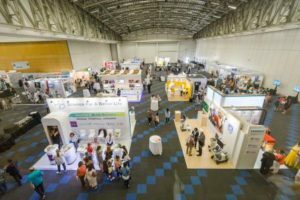 Pre and post Workshops took place at the Conference Centre and also at the Red Cross Children’s Hospital and new Netcare Christiaan Barnard Memorial Hospital. Many of the delegates took the opportunity to get to know Cape Town and its surrounding areas by booking tours through Turners Conferences.